Caddo Lake, named after the Native Americans called Caddo Indians or Caddoans, is located on the border between Texas and Louisiana. According to Caddo Indian legend, the lake was formed by a giant flood. Other theories attribute the lake’s origin to an earthquake. Covering over 26,000 acres, Caddo is the largest natural lake in the south, and the only natural lake in Texas. 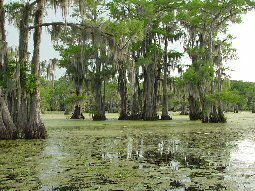 It is fed by Big Cypress Bayou, Little Cypress Bayou, Black Cypress Bayou and Jeems Bayou. Half of the lake is in Texas and half is in Louisiana. 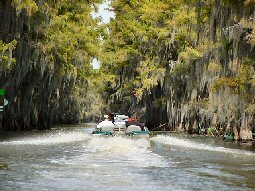 Caddo Lake is home to one the largest cypress forest in the world. This vast forest of bald cypress trees, draped with Spanish moss, is an internationally protected wetland under the RAMSAR treaty. In the early 1900’s, the Gulf Refining Corporation built a dam at the east end of the lake to raise the water level in order to accommodate drilling equipment when oil was found under the water. Caddo Lake then became the site of the first over-water oil well in the world. The lake’s diversity of wildlife includes 216 kinds of birds, 47 species of mammals, plus 90 varieties of fish and reptiles.